A national survey conducted by Apartments.com in 2013 revealed that three-quarters of apartment dwellers are pet owners, a 32 percent increase from 2012. The majority of those indicated they owned either a cat (45 percent) or a small dog (38 percent), although one out of five reported having a medium or large-sized dog. A little more than two-thirds of renters said they faced some difficulties in finding places that will allow their pet. Fortunately, that search can be made a bit easier, whether you're looking for a pet-friendly abode in a small town or a major city by perusing sites like ForRent.com. For example, when searching for apartments for rent in Atlanta, the results can be tailored not only specific areas like Athens, but also can be narrowed down to include pet policies, such as those that accept cats, small dogs, or even large dogs. Once you've moved into your apartment, consider these tips for making living with your pet in a small space easier as well as improving his or her quality of life. One of the drawbacks to apartment living is not having a yard, but this can actually be an advantage as you'll have an excuse to go outside and meet the neighbors, as well as some of their pets. You don't have to have a dog to take your pet for a walk either. In fact, cat behaviorist Jackson Galaxy believes leash-walking a cat can help burn off that extra feline energy. Both dogs and cats need plenty of exercise and playtime. If you have a neighborhood dog park, this can be a great way to allow your dog a bit of freedom and socialization with other dogs. 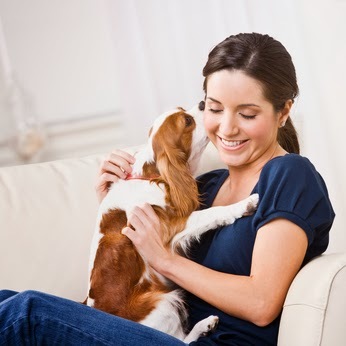 Helping your pet become more comfortable around new people is also important for better apartment living. During your walks or visit to the dog park, allow strangers to gently interact with them. If you hope to remain in good graces with your landlord, as well as the other tenants, being a responsible pet owner is a must. Remember that not everyone loves animals as much as you do, and you'll need to respect that. Try to keep your pet quiet as much as you possibly can, particularly in the early morning hours and at night. Being woken up by a yowling cat or a barking dog is enough to make anyone's blood pressure rise. It's also important that your pet's vaccinations are up to date so that they don't spread any diseases or parasites. Pets need to have their own space to retreat to, just like humans. If you're gone during the day, it's even more important to make your pet feel comfortable while he or she is alone. You might lay out a comfy pillow and blanket for your dog along with a few favorite toys, or set up a special area for your cat with a scratching post and a place to hide. Cat trees are great as cats naturally love being up high so that they can keep an eye on what's happening below. Guest post by Joel Mccoy. Joel is a pet photographer who is scared of any dog larger than a poodle. That is a good point that without a yard one has to go out more and that can mean more socialising. Have a marvellous Monday. Whether traveling or looking for a place to rent, it's easier to find a place to stay or live with a small dog, than with a larger one. Many places have weight limits for pets. I lived in a one bedroom apartment with two big dogs, Sephi and Maya. You'd think a one bedroom apartment would be rather small for two big dogs, but things weren't much different when we moved into a house with a big fenced yard. They still spend most of their time indoors and are most often found in the same room I am in. It is fairly easy to find a pet friendly apartment where I live. If someone here gives up their dog because they are moving into an apartment, you know they didn't even try to bother looking for a pet friendly apartment. I know it's not the same everywhere, but I do think more and more places are becoming pet friendly. The more responsible we are with our pets, the sooner it will happen.